Director – J. Lee Thompson, Screenplay/Based on the Novel by Max Ehrlich, Producer – Frank P. Rosenberg, Photography – Victor J. Kemper, Music – Jerry Goldsmith, Art Direction – Jack Martin Smith. Production Company – Bing Crosby Productions. Peter Proud, a history lecturer in California, has a series of recurring dreams in which a woman named Marcia batters and kills him while he is swimming. He consults a sleep specialist, only to learn that he is not in a dream state when he has the dreams. This leads him to the realisation that he must be experiencing memories from a past life. A documentary on tv helps Peter identify some of the landmarks from his dreams as being in Massachusetts. He heads there, searching the entire state until he finds places he recognises. He refines the search until he locates the lake and then discovers that the person whose memories he is having was Jeff Curtis who drowned in 1946. He then meets Jeff’s daughter Ann. The two are drawn together and have a romance. Ann then takes Peter to meet her mother – none other than Marcia, the woman who killed Jeff – where the presence of Peter and her seeing many of Jeff’s familiar habits starts to expose her guilt. The 1970s was the Age of Aquarius, the era that followed on from the 1960s and its experiments with alternate religions and states of expanded consciousness. It is no particular surprise then that the film and popular literature of the decade reflected this. We saw the rise of the LSD films in the 60s, the popularisation of the UFO film in the 1970s (and a host of nutty ideas that went along with it). The 1970s also saw the rise of the occult film with successes such as Rosemary’s Baby (1968) and The Exorcist (1973) popularising a fascination with black magic and devil worship. 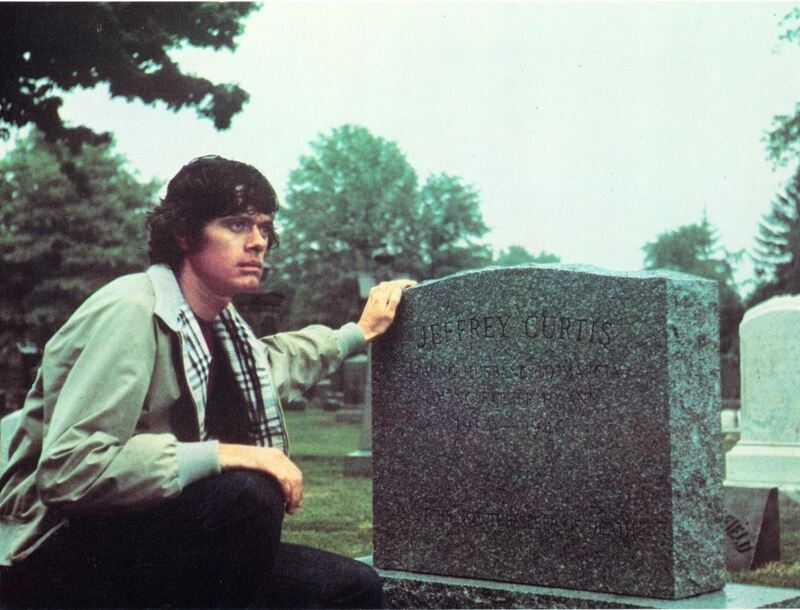 Among these, there was also two serious, studio-backed treatments of reincarnation themes with The Reincarnation of Peter Proud here and the subsequent Audrey Rose (1977). 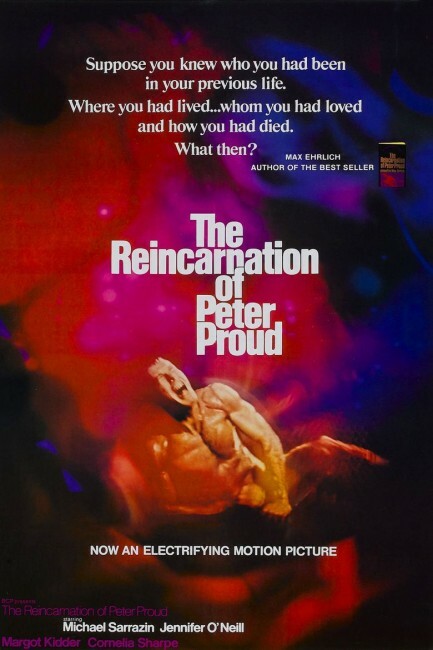 The film was based on the novel The Reincarnation of Peter Proud (1973) by Max Ehrlich, which proved to be a modest best-seller. Ehrlich had written a number of other novels and a good many scripts for radio and television. These have included episodes of genre series such as Tales of Tomorrow (1951-3), Voyage to the Bottom of the Sea (1964-8) and The Wild Wild West (1965-9), even an episode of Star Trek with The Apple (1966), as well as one science-fiction film, the over-populated future dystopia Z.P.G (Zero Population Growth) (1971). J. Lee Thompson was a British director who found his feet in quota quickies during the 1950s before having the big international box-office hit of The Guns of Navarone (1961) and quickly being brought to the US to make Cape Fear (1962), one of the great thrillers of the era. Thompson moved through a series of A-budget films for the US studios with the likes of Taras Bulba (1962), McKenna’s Gold (1968) and two Planet of the Apes sequels. His career of the late 1970s through the 1980s is marked by a series of oddities and flops such as The White Buffalo (1977), The Greek Tycoon (1978) and the slasher film Happy Birthday to Me (1981) before ending up at Cannon Films for a slew of Charles Bronson action vehicles and their single worst film King Solomon’s Mines (1985). (See below for J. Lee Thompson’s other genre films). I had heard about The Reincarnation of Peter Proud for many years before getting around to seeing it. It has a very mixed critical reception. Certainly, it is made with an A-polish sheen that carried it to audience appeal back in the day. Immediately after you start watching, any anticipation is killed off by an incredibly sedate pace on the part of J. Lee Thompson. What it feels like is less a slick, well-produced studio film than a ploddingly earnest tv movie treatment of reincarnation themes. You keep wishing Thompson would get his act together and generate some of the relentless suspense of Cape Fear. Some of this does come during the last ten minutes but prior to that the scenes with Michael Sarrazin seeking treatments for his dreams, searching the Massachusetts countryside for landmarks from his previous life and then romancing Jennifer O’Neill contains little suspense. Moreover, the film’s title has already told us that we are watching a reincarnation drama so a good half of the film involves us sitting back and waiting for Michael Sarrazin to connect the dots and piece together what we already knew before we sat down. Things pick up somewhat towards the end. We have Margot Kidder looking brooding and unbalanced and it is not too hard to see where everything is going. (It should also be said that the film’s makeup team does an incredibly unconvincing job of aging Kidder, who was 27 when the film came out, into someone in her sixties). What I found somewhat peculiar was the central character’s moral blindness. Michael Sarrazin has a girlfriend (Cornelia Sharpe) who at one point seems to make a comment about having agreed to marry his friend when he returns to town. This leaves you with raised eyebrows but the film never delves into this any further. Despite being involved with her, Sarrazin then wanders off and engages in a relationship with Jennifer O’Neill, who is the daughter from his past self. You cannot help but think there should have been some point in the film where he pulled back and went “whoa, what am I getting into here?” Yet with Sarrazin’s handsomely amiable looks, such questions never trouble the title character. In recent years, The Reincarnation of Peter Proud has been mentioned as a remake, at one point to have been directed by David Fincher. although this has yet to be greenlit. The story of a reincarnated husband in a younger body hooking up his own daughter and then coming home to meet his own wife from years before was later played for comic possibilities in Chances Are (1989). J. Lee Thompson’s other films of genre interest are:– the classic revenge psycho-thriller Cape Fear (1962), the occult film Eye of the Devil (1967), the Communist China spy thriller The Chairman/The Most Dangerous Man in the World (1969), Conquest of the Planet of the Apes (1972) and Battle for the Planet of the Apes (1973), the Western The White Buffalo (1977) with Charles Bronson hunting a mythic buffalo, the slasher film the slasher film Happy Birthday to Me (1981), 10 to Midnight (1983) with Charles Bronson vs a serial killer, and the utterly dire adventure film King Solomon’s Mines (1985). J. Lee Thompson also co-wrote the scripts for the very strange psycho-thriller East of Piccadilly (1940) and the bizarre time travel/adventure film Future Hunters (1986).